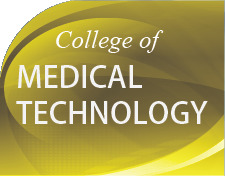 The program for BS Medical Technology is envisioned to develop competent medical technologists who will be responsive to the needs of local and global communities in the detection, diagnosis, prognosis, prevention and treatment of diseases with scientific foundation and through innovative technologies. The General Education Courses for first two years are taken at the UE Manila Campus while the professional courses and clinical internship are at the UERMMMCI campus on Aurora Blvd. Eventually when upon the expansion and construction of facilities in UERMMMCI, it will accommodate all courses. Clinical laboratory practice in hospitals, clinics and diagnostic centers, government facilities and accreditation offices.